Published Nov 20, 2014 by Sams. Part of the LiveLessons series. Review Windows system requirements and upgrade paths; use the Upgrade Advisor; assess current application compatibility; learn what you need to know about Product Identification Keys; and walk through local and network installations. Understand user accounts and work with Windows User Account Control (UAC); explore and master core Windows administrative tools; control interface options; create convenient shortcuts; work with User Profiles; and understand both Med-V and App-V virtualization. Use Internet Explorer, Windows Media Player, and Windows Media Center… use the Snipping tool… use offline files… work with Windows Mobility Center and Remote Desktop Services… get comfortable using the Microsoft Management Console and Windows PowerShell. Manage local and network applications… remove applications… use group policy… work with services and MSCONFIG… master Windows file systems… understand network locations… begin using Windows security and encryption tools. Understand Windows Plug and Play hardware… set up printers… install drivers… compare and utilize different types of storage devices, including cloud storage… connect media devices… use the Control Panel's Device Manager. Understand and use HomeGroups and shared folders… map drives for user convenience… work with the NTFS file system… set up permissions for shared folders… share printers. Defragment and clean up disks… set Scheduled Tasks… make the most of Windows' Action Center. Discover Windows Registry; updates and hotfixes; and how to protect Windows. Understand and use different backup methods. Discover backup options and learn about system restore. Understand recovery boot options and safe mode options. Understand test objectives and preparation strategies. Discover test taking strategies and how to sign up for the exam. Your complete Windows video course: hands-on skills for real-world success, plus expert prep for your MTA 98-349 (Windows Operating System Fundamentals) certification exam! In this unique video package, top IT instructor/consultant Ed Liberman helps you master the core skills you need to run and manage Microsoft Windows, and fully prepare for your MTA 98-349 certification exam. 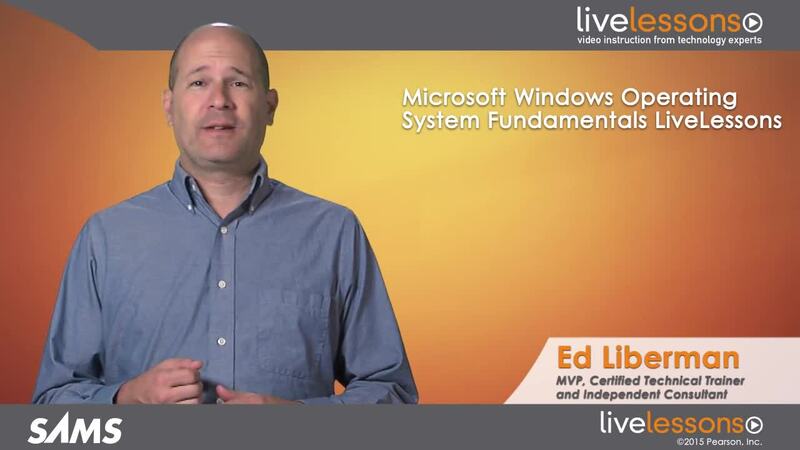 Drawing on his experience helping thousands of people supercharge their IT careers, Ed helps you develop real world skills for success with Windows -- and even have fun while you learn. Step by step, you'll build and deepen your knowledge of installing, upgrading, and configuring Windows; managing applications, files, folders, and devices; and even maintaining Windows systems. Ed Liberman (MVP, MCP, MCSA, MCSE, MCDST, MCT, MCTS, MCITP, A+, Network+, Server+, CWTS, CWNA, CWNT) has worked in technology for over 20 years. He has been certified and instructing IT since 1998, and has helped thousands of people get started in IT or advance their IT careers. When not teaching, he consults independently with corporations seeking to improve their network infrastructure.